(Excerpt)By Donna Gillespie, Author of The Light Bearer and Lady of the Light: I was a student of Leonard Bishop’s for seven years, from 1976 to 1983, part of an ongoing writer’s workshop that had grown out of his novel writing class at UC Berkeley Extension. I don’t think I ever would have made the leap from short stories to a novel without Leonard’s constant carping and encouragement. Those Monday night meetings were like revival meetings for writers — even if you’d been languishing in the depths of writing despair throughout the week, on Monday nights you walked out of his class knowing without question that writing was the most necessary thing you could be doing for the planet. Sell the house, sell the kids. Lose the boyfriend, lose the job. Just write. It was a holy mission. He told us that all time you spent writing mattered, even if you eventually threw the whole scene away. “Writing begets writing,” I remember him saying again and again. His theories on craft and techniques of maintaining suspense dazzled me. They seemed to come from a fathomless well — I don’t think I ever heard him explain anything the same way twice. So if you didn’t get it the first time you were bound to eventually. That is, as long as you kept submitting chapters to the group. For four years I gave him short stories because I couldn’t get a novel started. All my stories broke off after 30 pages. They just refused to become novels. Leonard was nice about it; he never mentioned the fact that perhaps I shouldn’t be there. (It was, after all, a novel writing workshop, and in a class of 30 I was the only one who wasn’t turning in chapters.) But while my back was turned and I was hardly aware of it, he was convincing me I was capable of writing a novel. Then another thing happened — the catalyst, I guess. I discovered Rome. I’d had this idea all along that the novel had to be contemporary. (I have no idea why.) Then I saw the miniseries based on Robert Graves’ I Claudius on PBS. And first century Rome took over my life. I was going back and forth to the San Francisco Library, snatching up eight books at a time — the limit allowed — anything with Rome in the title. I finally started what I knew was going to be a novel, and presented Leonard with a small stack of pages with “Chapter One” at the top — a miracle. Of course it was set in Rome. And soon I burst past that 30-page limit hardly knowing it was there. When Berkley/Putnam bought the book, I had a whole additional draft to do. By this time Leonard had left San Francisco and was teaching in Kansas, but I continued to submit chapters to him through the mail. His critiques, blistering, concise, sometimes typed so enthusiastically that he punched a hole in the paper when he typed the letter “o”, continued to come. He was loud, even on the page. I still hear him barking in my ear from time to time. The book I began in Leonard’s class was The Light Bearer, and it’s Leonard’s book as much as mine. He always got mad when I tried to tell him that. But it was true. Catherine Hedge’s post: I’m Sure There’s A Book in Me, Somewhere! I am still incredibly amazed to be learning about your journey. Reading The Light Bearer sticks out in my memory as the moment when literature and writing became an intergral part of my life. I am very excited to track down “I Claudius” and see what inspired you to take on such an amazing task. 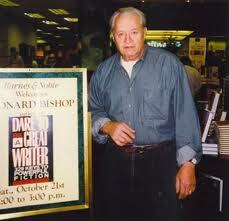 Thank you for your work and sharing Leonard Bishop’s teaching with us. I still hope to sit down in a cafe some day with you and Cathy.